Smarter, not harder. That’s the goal, right? In investing, smarter can mean a lot of things, but one of the easiest ways to invest smarter is to invest younger. Investing early in life practically guarantees financial freedom later in life. I’m not a fan of the stereotypical American model of retirement, or at least the general perception of retirement in the United States. I think retirement is about freedom, but we’ll talk more about this in the last point. Kids will typically invest similarly to how their parents invest. That means that if you don’t invest, well, there’s a good chance they won’t either. Whether your kids choose to invest in stocks, bonds, real estate, businesses, commodities, peer-to-peer lending, or inventions, starting young will increase their chances and amount of success. These are eight reasons it’s so important for your kid to start investing as early as possible. There are many more reasons I’m sure, but I feel like eight is enough. Do you understand how compound interest works? You need to understand it to explain it, but don’t worry: it’s a simple concept. Pop quiz! If you made a single investment of $1,000, with an annual interest rate of 10%, how much money would you have in 10 years? If you said $1,100, you’d be wrong. If you said $2,000, you’d still be wrong. Those are the two most common answers I hear. So how much would you have? $2,593.74. If you understand why, skip to the next point. If not, let me explain. You may be forgetting one simple fact: at the end of the first year, you would have a total of $1,100 with the 10% interest added in. That means you’d earn 10% of $1,100 in the second year, and so on. As your money grows, you earn interest on a higher amount. See? Simple. If there is one thing your child should see about investing, it’s the following chart. Given my surname, I don’t like the fact that Bruce was the poor decision maker here, but the chart is so important, I shared it anyways. I’m taking one for the team. You’re welcome. Bruce never catches up, even though he invests the same annual amount for almost 40 years longer. Why? Because David did something unbelievably simple: he started early. More on Compound Interest: 15 Finance Terms Your Child Must Understand. While 80% of parents believe it’s important to talk to their kids about money, 71% of parents are reluctant to do so, according to a T. Rowe Price survey 1. I didn’t know a thing about investing until I hit my mid 20s. The more your child learns now, the more years he has to put this experience into action. Money isn’t the only thing that compounds. 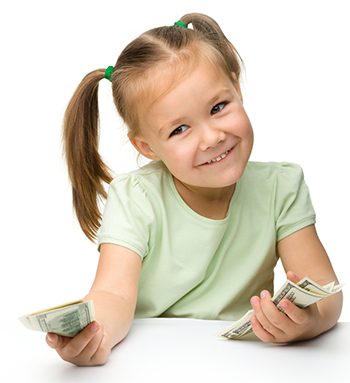 Investing at a young age will give your child compounded experience. Experience often translates to mistakes. Mistakes are ok if they teach a lesson. The younger you start investing, the more time is on your side. If your child starts investing in her teens, she will have plenty of time to make plenty of mistakes with her money. And we all make plenty of mistakes with our money. Financial mistakes can be devastating. Let’s not forget that a 50% loss completely offsets a 100% gain. Money mistakes hurt. But they hurt less when you’re young. Making these mistakes at 18 or 20 gives your kid plenty of time to get back on the horse (…bull?) and try again. She may totally screw up, invest poorly, and lose all of her money, but now she has so many years left to recover, with more experience. It’s well known that you can afford to take more risk when younger, and progressively less risk as you age. Learning from other people’s mistakes is always best, but it seems like we have to learn some things the hard way. I feel like points 2, 3 and 4 are all kind of the same thing, but it’s important to break it down into these three ideas, because they’re all equally valuable. In general, the higher the risk, the higher the potential gain. Some people start investing so late that they virtually can’t take any risk. When your child starts investing early, she can take all the risks! Well, maybe not all the risks, but much more than someone who’s late to the game. It’s true that the best time to start was 20 years ago, but the second best time to start is today. That idea is typically applied to people who started investing later in life to show them that it’s never too late to start. But it’s always the right answer to start earlier. You may be the one, like me, who wishes you would’ve started investing 20 years ago. Since we can’t go back in time as far as I know (I’m still working on it), we can at least help our children not make our mistakes. Learning to “pay yourself first” is so important for kids. The first fruits go to God, but the second goes to you. Automatically deducting giving, investing and savings leaves your child with finances that are more organized than the majority of people’s finances. Honestly, budgeting isn’t even that important if you deduct the important stuff first and live off the rest. So long as you’re living off real money, as opposed to the type of money that’s about the size of a business card but harder. A child who starts investing at a young age will have, in a sense, forced financial organization. The important stuff is being accounted for, which leaves the rest to be spent responsibly. Your child can figure out the types of investing she likes, and the types she doesn’t. Doing this at a young age equates to more time to do the investing she prefers. She may take a huge hit in the stock market when she’s young, and decide that she prefers the stability of real estate. She may discover investing tools that make it easier and fun. There’s so much room for activities time to figure these things out. Think about it. If your child decides she wants to invest in rental property and begins to save for her first investment home at 18, she could own a full portfolio by the time she’s in her early 40s. With an IRA (Individual Retirement Account/Arrangement), there’s something called “catch-up contributions.” For people 50 and older, they’re allowed to contribute an additional $1,000/year to catch up their retirement. The government understands that they need to contribute more money than your 20-year-old son does. Because they didn’t start early. In a study done by GYC (Grow Your Capital), they used the example of a 20-year-old who would need to save a mere $158/month for 40 years to have a million dollars at age 60 (assuming a 10% rate of return). Over the 40 years, he would only contribute $76,000 of his own money. Compare this to someone who is 40… who would need to set aside $1,317/month, for a total of $316,000 in contributions, to reach that same million-dollar goal by 60 2. When your child starts investing young, compound interest and time will contribute more to his retirement than he will. That’s the point behind all of this! The younger you start, the less you have to contribute. It’s that simple. When you add up all seven of the points I’ve made so far, the result is #8. Now for the event you’ve all been waiting for. Just like all roads lead to Rome 3, all of the above points lead to early retirement. Like I said in the beginning, I’m not talking about the retirement you think. What does retirement mean? It means freedom. Financial freedom. I don’t like the word retirement, because it eludes to the idea of quitting work to do absolutely nothing with your life. That’s the idea many have of retirement. Nothing could be further from the truth. Well, actually, a lot of things could be further from the truth, but we won’t get into those here. Retirement, as a government concept, was adopted by countries during the late 19th century and the 20th century 4. It’s a concept that has was created and has been sensationalized over the last century (censationalized?). That’s not the kind of retirement I’m talking about. I like to define retirement as a point in life when you have enough passive income, through investments, businesses, or pensions, to fully do what you want with 100% of your time. This could mean anything from world missions, to starting a business you’ve always been passionate about, to opening a homeless shelter. Retirement is the goal because it puts you in control of how you spend your time, not because it means you no longer work. I think it’s God’s intentions that we will always work. I don’t believe we “deserve” to stop working just because our nest egg reaches a certain size or we reach a certain age. People who stop working entirely won’t have to worry about many retirement years, because they won’t last that long. That’s the hard truth. The basic American view of retirement is slothful and wasteful. Encourage your kids to start investing early on in life to create productive, meaningful retirement years. Of course, it’s their choice how they spend those years, but encourage them to do something big for the Kingdom of God in those years. Early investing makes that possible. Did you have someone to teach you this stuff as a child? T. Rowe Price Staff. (2016, March). 8th Annual Parents, Kids and Money Survey. T. Rowe Price. GYC Staff. (2016). Are Youths Ready for Financial Independence? Grow Your Capital. * After much research, it turns out that, in fact, all roads do not lead to Rome. Because oceans. Weisman, M. (1999, March 21). The History of Retirement, From Early Man to A.A.R.P.. NY Times.